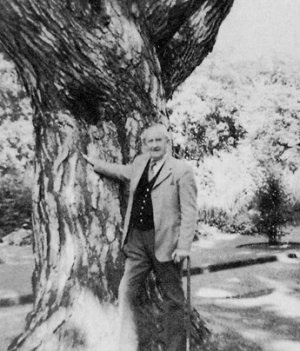 Was Tolkien a “tree-hugger”? That’s a loaded term, but Tolkien readers know that he was concerned about our natural environment and that, yes, he loved trees. 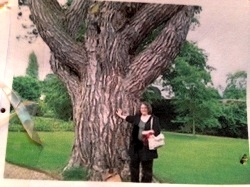 The above picture shows Tolkien in the Botanic Garden in Oxford in 1973 with one of his favorite trees, a black pine (Pinus nigra). Sadly, that tree suffered damage last summer and had to be cut down a few months ago for safety reasons. You can watch a video by Jill Walker, “Tolkien’s Tree,” to see how spectacular the tree was at its best and how it was taken down. Plans are being made to commemorate the tree and its significance for Tolkien and for the many visitors who came to see it; you can follow the Tolkien Society for updates on this matter. In this week’s “Talk on Tolkien,” I’ve turned to Tom Shippey, who offers some thoughts on Tolkien’s views of this “tree-tangled Middle-earth.” This video records Shippey’s presentation, “Trees, Chainsaws, and the Visions of Paradise in J.R.R. Tolkien,” at Arizona State University in 2002. Shippey starts off with some reflections on Tolkien as a “tree-hugger,” and then goes on to show us some ambiguities in that love of trees and to suggest its mythic significance. Shippey is well known as a Tolkien scholar and medievalist through his many publications, particularly The Road to Middle-earth and J.R.R. Tolkien: Author of the Century. As usual, his talk is lively, opinionated, informed, and interesting. As with last week’s talk by Verlyn Flieger, Shippey offers an approach to thinking about Tolkien’s fiction in general. In this talk, Shippey refers to two Middle English texts. Tolkien’s translation of the poem Pearl is included in the posthumous publication Sir Gawain and the Green Knight, Pearl, and Sir Orfeo. If you’re interested in the Middle English text of the poem, you can read an edition of Pearl by Sarah Stanbury on the TEAMS: Middle English Texts Series website. You can also find out more about The Book of John Mandeville and read the Middle English text on that site in an edition by Tamara Kohanski and C. David Benson. Shippey also talks about various poems in The Lord of the Rings, including the Elves’ hymn to Elbereth Gilthoniel. As mentioned in the video, Tolkien translated most of this poem for Donald Swann, who set some of Tolkien’s poems to music in The Road Goes Ever On (you can still buy the book and CD). One of my favourite musical versions of the hymn to Elbereth is by the Tolkien Ensemble. You can listen to one of their renditions of the Elven Hymn to Elbereth Gilthoniel. (And if you like it, buy their CDs!). I especially love the Tolkien Ensemble’s version of Galadriel’s Song of Eldamar — in my view, the perfect evocation of not only the love of this “tree-tangled Middle-earth” but also, as Tom Shippey points out, the longing for an earthly paradise.